For the first time since we’ve started RVing we began the next leg of our trip, leaving Cheaha Mountain without having decided in advance where our stop would be for the evening. As we drove down off the mountain, the clouds followed us. 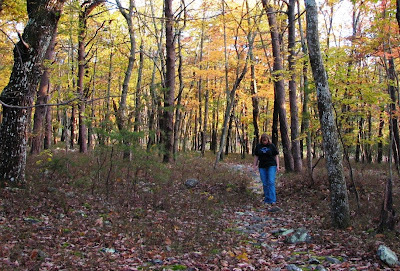 The autumn foliage was gorgeous, despite the rain that followed us north. Unfortunately, it’s pretty hard to get a photo that gives it justice through the raindrops. 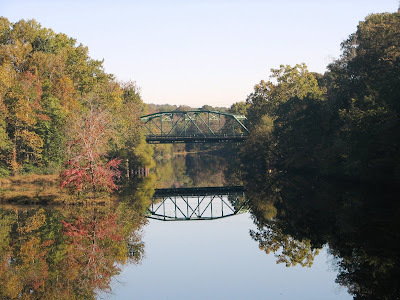 It had been ages since we did a commercial RV park or stayed close to a major city. After several days of intermittent rain and fog, we decided it was time for a down day where we could update the blog, update our budget actual, and regroup to plan the remainder of our trip. 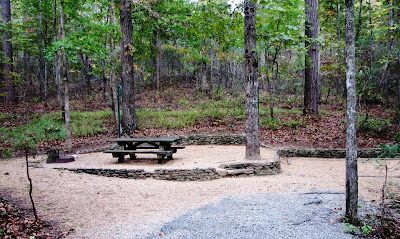 While the Trav-L-Park in Chattanooga may not be our favorite kind of park, since it makes no attempt at being ‘in nature’, and at $33.30 per night, it was definitely beyond our $20 per night average budget, it was really nice to have Internet and cable TV and great restaurants nearby. The other great part of this park was Steve Oliver. While he wasn’t the owner, he was the main person we worked with at the front desk. He was very hospitable and helpful with restaurant recommendations and directions. 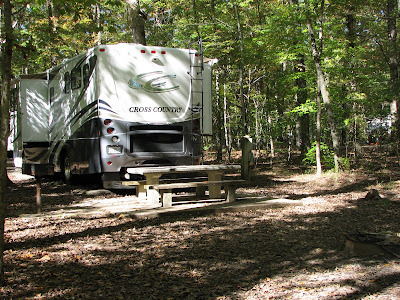 Since we have done some cheap overnights this month at Corp of Engineer parks, overall we are still staying slightly below our $20 per night average on campsite costs, so we seem to have that figured well. Now eating out, that is a different story. Ken and I both really love to try new restaurants so our $240 a month budget just isn’t cutting it. We will have to figure that one out. Right now since we are not using our budgeted $80 for satellite TV or our budgeted $60 for an internet wireless air card we are ok overall. Speaking of eating out…we now have 2 great recommendations on Chattanooga restaurants. The Rib n Loin is considered the #1 BBQ joint in Chattanooga and definitely deserves that distinction. Ken and I shared the rib platter for two which included 2 lbs of ribs, two huge fully loaded baked potatoes, fried okra, cole slaw and texas toast for $25.99. Every single dish was really tasty and the service was good as well. We had enough leftovers for a great lunch the next day back at the rig. The next night we took Steve’s second recommendation which was a family-owned restaurant named Eidson’s that has been in business since 1954 and is particularly known for its fresh and from-scratch dishes. Ken had the fried Red Snapper and I had the grilled. There was fresh homemade cornbread and hushpuppies on the table. The fish was perfectly prepared and we’d especially recommend the marshmallow candied yams. Again, I had twice as much food as I needed which meant a great lunch the next day. Sorry we have limited pictures on this phase of the trip. The camera setting got juggled and we went about 48 hours with trashed pictures before we realized what was happening. 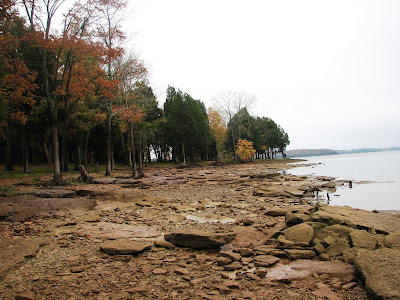 After looking at our options for the days before the next game, we decided our next stop should be at the J. Percy Priest Lake at the Seven Points Campground . Online info noted that this is the busiest Corp of Engineers campground in the nation. After driving, yet again, through rain for several hours we arrived at a campground, and quickly decided that this park rivals Corinth as our new favorite location. Definitely had the ‘it’ factor with gorgeous sites, many overlooking the lake. Of course, the $10-12 rate for Water/Electric sites using Golden Access Pass made it even more attractive. Also, while civilization ‘felt’ far away, you were only a mile or two from stores and only 5 miles from the Hermitage, Andrew Jackson’s plantation home. 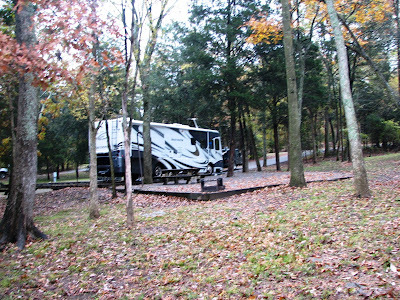 The campsites were very large, paved with lots of privacy. 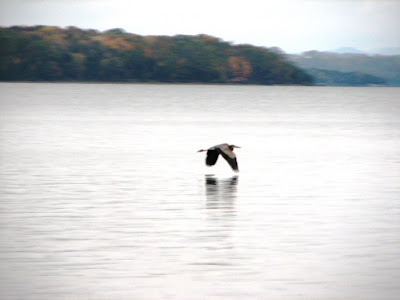 Did ‘Harry’ Heron follow us from Land Between the Lakes? We would have definitely stayed at this park right up to game day but, unfortunately, it was only open for two more days and then closing for the season. We enjoyed a long talk with the gate attendants, fulltimers who worked the park 7 months out of the year and then toured the Southern states during the winter months. They explained a little bit about how Corp of Engineers hires workkampers. I had expected that all these workers were hosts who did the work in exchange for a site but apparently they bid for the position annually and make about $100 a day (depending on location/bid) besides having a full hookup site. 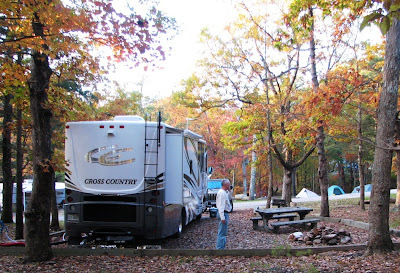 It was obvious this couple felt blessed to work at this beautiful campground where they say they have few problems and meet lots of great people. We devoted Wednesday to a visit to the Hermitage. 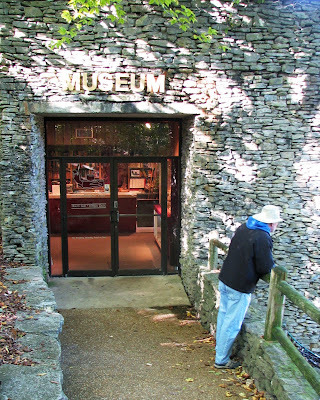 Although we’d read that you should allow 2 hours for this visit, we ended up spending 4 hours there, learning a lot of interesting, less known facts about Andrew Jackson and his family. 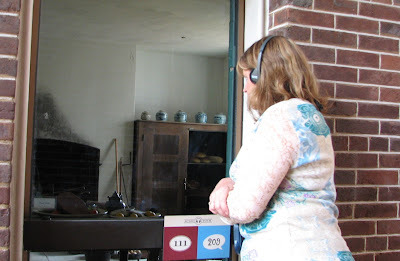 While there are tour guides in the plantation itself, we spent most of our time outside the home following the tour with headphones with numbers at each key point where you can key in the number and get more information on what you are viewing. In fact, they have different ‘childrens’ numbers that tell the story at a grade school level. 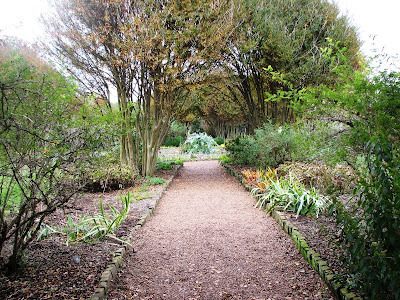 One of our favorite areas on the plantation was Rachel’s Garden, especially the herb garden where they encouraged you to clip and smell the oregano, sage, rosemary and many other fresh herbs. In fact, Ken pulled a couple twigs of the abundant rosemary and put it in his pocket. Later, he used it on some grilled salmon back at the rig—pretty neat having General Jackson contribute to our evening meal!! 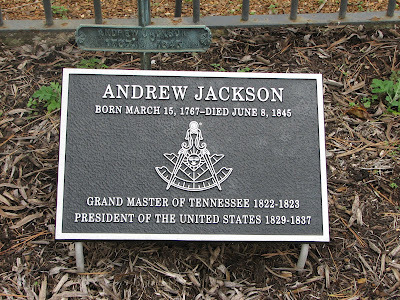 Did you know the Jackson was one of many of our early American leaders who was at a high level with the Masons? This caught my attention since I recently read Dan Brown’s Lost Symbol that focus on the Masons in the US. 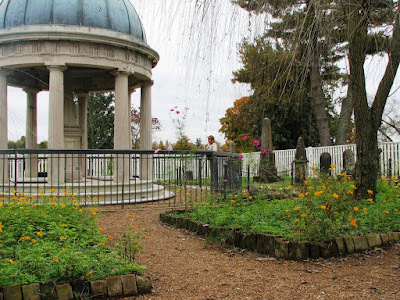 Andrew and Rachel Jackson’s tomb takes up one corner of the garden. Apparently, from his many letters, Andrew idolized his wife, Rachel, and her tomb has a long and loving inscription he’d written for her. In contrast, by his direction, the slab over his tomb simply identifies him as General Andrew Jackson. Even during his 8 year presidency, he preferred to be addressed as ‘General’ not as ‘Mr. President’ considering his military position as his primary accomplishment and contribution. When, due to some structural issues, it became necessary to open these tombs a few decades back, a mystery was ‘unearthed’. As expected, based on practice of the time, Rachel’s coffin was found under 6 feet of earth. However, Jackson’s coffin was down 6 feet but, contrary to practice, was covered with no dirt. In the plantation fields, we stopped to inspect the cotton crop. Ken and I had never had the opportunity to actually walk in to a cotton field before. We learned that cotton is not considered a viable cotton crop in Tennessee today because it requires a 200 day growing season and is always in danger of being wiped out by early frost this time of year. This crop is still nearly a month away from harvest. 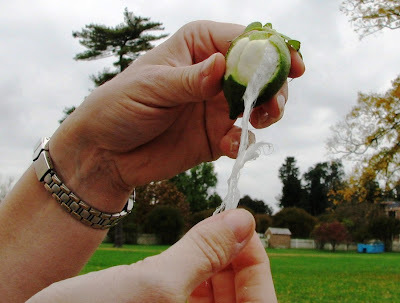 We picked a boll to take a look at what the cotton looked like inside at this point of the growing season. 1. Jackson owned between 100 and 150 slaves. While his policies showed a man passionate about the rights of the common man, he considered these rights only applicable to men who were white. In fact, he signed the legislation that resulted in the Indian Trail of Tears march and, from what is found in his letters, was not at all hesitant to direct flogging of any of his slaves who got out of line. This explains why the Jackson slaves were quick to desert the plantation when emancipated. He also was notably against any consideration of equal rights for women. 2. 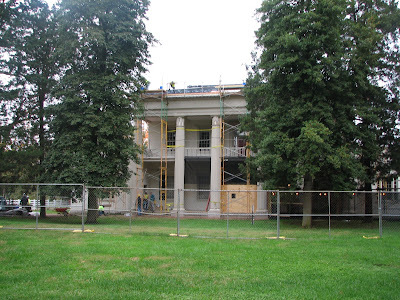 Jackson’s beloved wife, Rachel, hated to be away from the Hermitage and was not at all looking forward to moving to Washington DC when her husband was elected president. As it turns out, she died suddenly only a month before they were schedule to move. Apparently her funeral drew 10,000 people to the estate. Amazing since it was a 4 hour buggy ride from Nashville (less than 20 minutes by car today!). There was a peculiar event that occurred during the interment when suddenly the household parrot suddenly got loose and disrupted the ceremony with a loud tirade of cussing—requiring that he be captured and removed before they could continue. 3. While Jackson supported displacement of the Native Americans, he showed personal compassion when, after a military campaign, he became aware that a little Indian boy had been left orphaned when his mother was killed in the battle. He took the child back to the Hermitage and raised him there. 4. Andrew and Rachel bore no children of their own. Andrew Jackson, Jr. was actually one of a set of male twins born to Rachel’s brother. Apparently, upon the birth of twins, this son was offered to Andrew and Rachel to raise as their own son. It’s hard to fathom this kind of arrangement. 5. Jackson descendants have been buried in the garden as late as the 1970’s. Surprisingly, there is also one of Jackson’s slaves buried in the garden as well. When the Jackson family fell upon financial hard times in the late 1800’s, Uncle Alfred came back to the estate and actually bought some of the original furnishings for the cabin on the property where he lived. 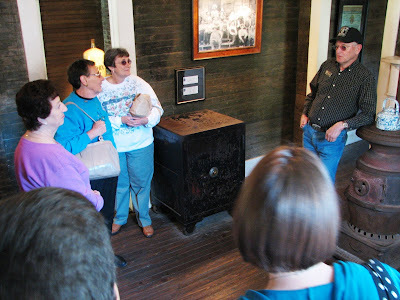 Around the turn of the century he acted as one of the first tour guides when the property was opened to the public. In exchange for the return of the original furniture to the historical society, it was agreed that Alfred would be buried in the garden beside the tomb of Andrew and Rachel. It was very late afternoon by the time Ken and I left the estate. We dropped in to the Panera Bread along our route and were frustrated by not being able to get their wireless to work. I am finding that only about ½ the places that say they have wireless internet have a functional connection that they understand how to troubleshoot when there are problems—arghh!! There was a Kroger next door so we knocked items off our grocery list and then headed back to the campground just ahead of the next rain front. The weather is suppose to be rainy now up until the weekend so tomorrow we plan to go ahead and make the drive to Murray, Kentucky, where we can set up a hunker down for the heavy rains while only a few blocks from the stadium. Will update you on the game as soon as we find internet again! Note: We have gone a week without internet access so check prior posts. We have published several in one day to get caught up!! 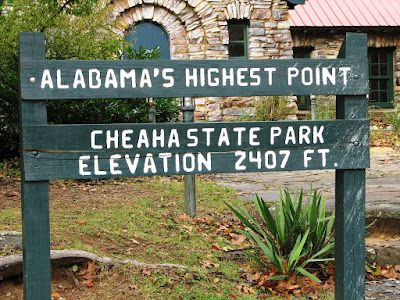 It seems that Cheaha Mountain was not to be one of our favorite destinations but mostly of our own doing. We arrived Thursday afternoon at the top of the mountain to find that our Brake Buddy had somehow malfunctioned, was going bonkers, and totally ran down the battery on the jeep. In what we’ve learned to be normal Alabama hospitality, we quickly had help from both a park ranger and a fellow camper. It took nearly ½ hour of jumping the jeep to get it charged enough to turn over. By the time we were able to finalize our campsite selection we were pretty limited in finding a site that would accommodate a 40 foot rig and a tent for our weekend guests. 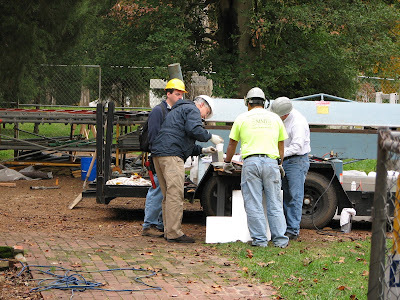 The closest we could get was a site that had more slope than we preferred and as a result had the sewer outlet in the ground actually higher than our outtake on the rig – not good. Nonetheless, the trees were beautiful in the area and the rustic accents of stone building, even stone fire pits added a nice touch. 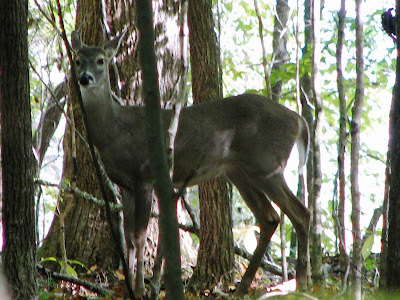 We had a beautiful area behind us that was a playground for gray squirrels, chipmunks and deer. Since Ken wanted to keep the jeep running for a while to complete charging the battery we decided to take a quick tour of the state park. As we headed back to the campground, it was obvious that the forecast heavy rains were on their way in. Ken and I spent most of the day inside Friday because of the heavy rains. Another reason this wasn’t one of our favorite destinations to-date. We decided late afternoon to head in to Anniston to pick up a few groceries since the weather wasn’t conducive to exploring outdoors. 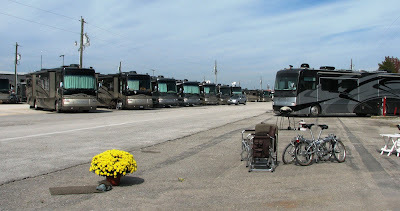 We stopped by an RV dealer / Camping World on the way to pass the time and check out some of the 2010 RV’s they had in stock—we enjoy that over a shopping mall any day! 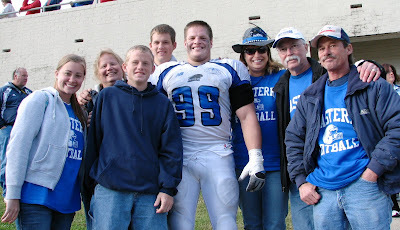 When we arrived back home late Friday afternoon, we received a call from Trevor reporting on the EIU football team’s plane-ride from hell. Apparently they weren’t having the best luck with ‘vehicles’ either. They had a chartered flight from Charleston, IL to Anniston, AL . At one point the plane apparently hit some sort of pocket or wind sheer that dropped them a long way, enough for the guys not in seatbelts to fly in to the air. But, the worst was on landing when they came down much harder than expected and immediately heard a loud boom . It turns out they blew a tire. The boys were apparently very happy to get off that plane. 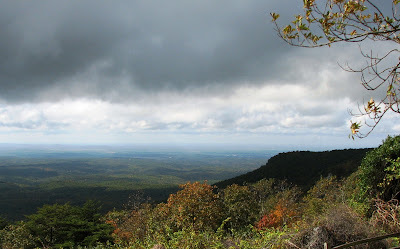 On Saturday, the rains had not cleared out up on Cheaha Mountain. Ken and I left for the hour drive to the game amidst heavy fog and rain. 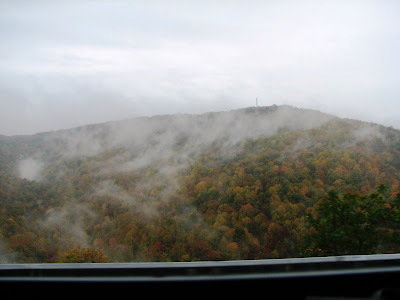 After we had driven a few mile, though, it was apparent that we had basically been sitting in a cloud on top of the mountain and that there was no fog and little rain as we got down to the lower elevations. It was pretty neat to look back from the bottom to see that our campground was sitting above the clouds. Trevor is continuing to nurse a high ankle sprain and problems with both shoulders. They have him wearing Sully braces on both shoulders to limit his range of motion in hopes of reducing further damage. You wouldn’t have known he should have been on the ‘disabled’ list from watching him on the field. Ha! Ha! 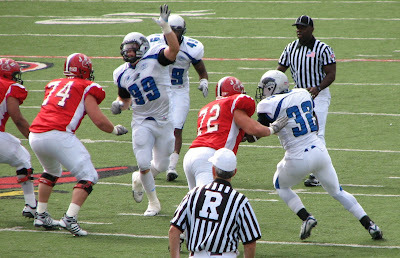 A Sully brace can't keep me from blocking passes!! 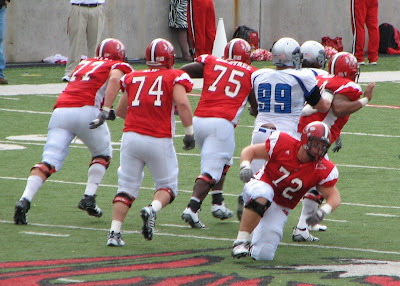 Ok I’m behind the O-Line but where's that guy with the ball? Trevor, Andre: Is this play called synchronized tackling? 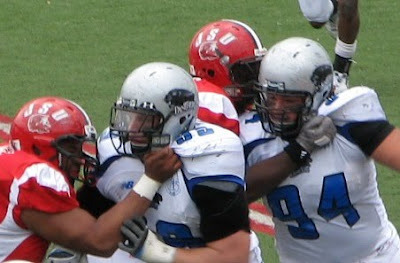 EIU played very well, came out early with a 14-0 lead and stayed ahead for the rest of the game. Giving up 20 points against a Jacksonville State offense with the high touted (and infamous) quarterback Ryan Perrilloux meant that defense really had a pretty good game. 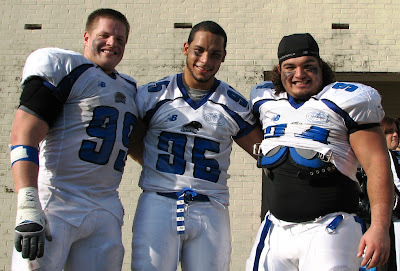 Trevor had 2 solo tackles and 2 assists. 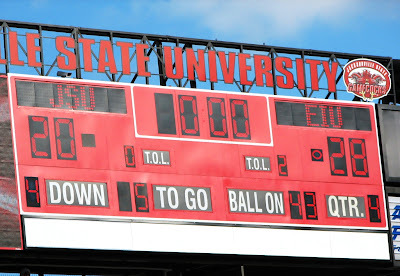 Final score JSU 20 – EIU 28! For a full team recap, click here. 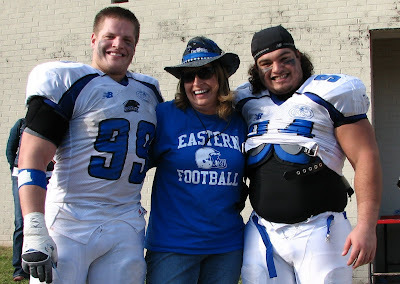 After the team came over to our stands to sing their fans the traditional EIU victory song, we met with them outside the locker room for a more detailed play-by-play and picture taking. 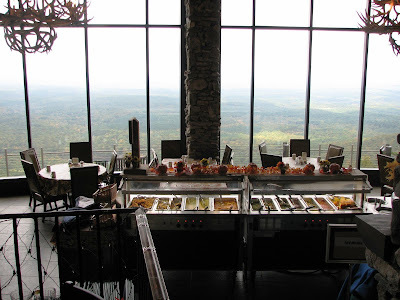 The Ellsworths came back to Cheaha State Park with us for the evening and we ate at the restaurant at the top of the mountain. 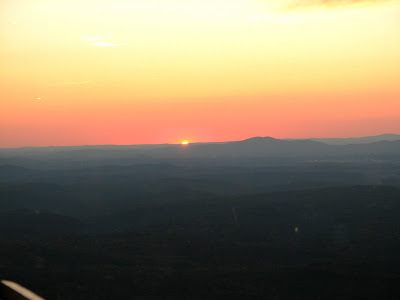 View of the sunset from Cheaha Restaurant ... priceless! With a full day out doors at the game, we were all yawning pretty quickly by the time we got back to the RV. Dave wanted to sleep in the tent but had trouble finding any other takers in the family who all liked the warmth of the RV. Actually Dave had it pretty nice with the full size bed air mattress and one of our ceramic heaters to keep him toasty. Ditka and Sox spent the night moving from one bed to another inside the rig making sure they kept everyone warm by snuggling up next to them. The next morning, Ken fixed his traditional big breakfast for our guests while we sat around chatting, waiting for it to warm up outside. In the afternoon, after seeing the Ellsworth’s off, Ken and I packed up, not exactly sure of our destination for the day except that we’d head north back in to Tennessee, generally in the direction of the next game. Since roads were tight and one-way at the top of the mountain we decided to hook up the jeep down by the park store. It’s hard to say exactly how it happened but following Ken down the mountain, I got a birds-eye view of the next incident that made this ‘not our favorite destination’. Apparently Trevor called in to update Ken on his ‘injury report’ at the same time that Ken reached the overcrowded store parking lot. 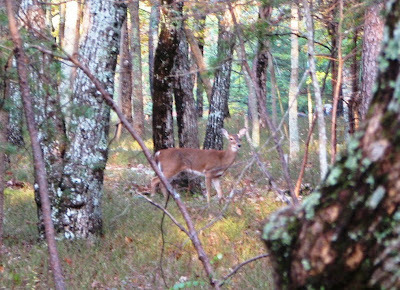 I was behind him. When he tried to pull over far enough to the side to be out of traffic he forgot about the post-and-rail fence to his right and put a nice long scrape along the passenger side of the motorhome. Lessons learned: no talking on cell phones while driving motorhome and have us both in RV cockpit when negotiating congested areas. The park ranger was very understanding and wouldn’t even take our offer to pay for the section of fence that we had knocked over. Since Ken had obviously dropped his call with Trev short, I called him back once we were hooked up and on the road. He was nursing a lot of aches and pains from the game but felt that with some rest this week he would be ‘game-worthy’ by next Saturday at Murray State. 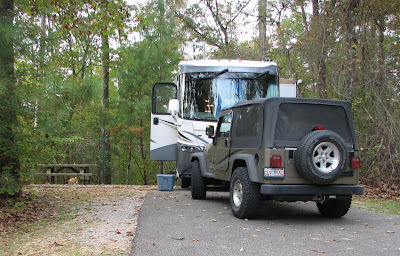 Ken and I decided that since we had gone without good TV channels, restaurants and internet access for many days now, stopping at a full-service RV park in Chattanooga was in order. 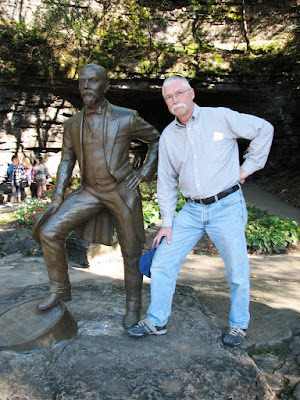 And so, I’m finishing this post from the Trav-L-Park in Chattanooga where, yes, I finally can get my fix of Internet! 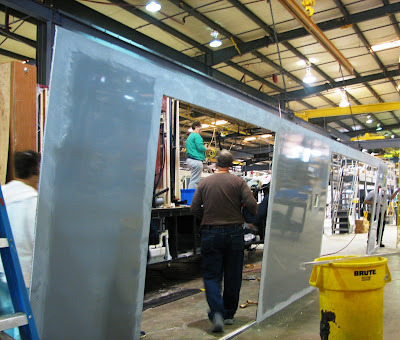 In the meantime, Ken has done some 'cleanup' on the side of the RV and now it really doesn't look so bad. It will be fine until we get back to Quincy where he can enlist nephew Jim to estimate and execute real repairs. I’ll post again soon as I can as we make our way west across Tennessee. 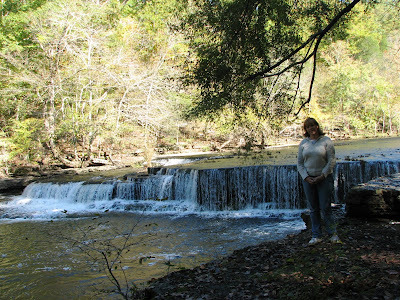 Tuesday, Oct. 20th, we left Old Stone Fort State Park in Tennessee about 1pm and drove to the Corinth Recreation Area in the William B. Bankhead National Forest in northwest Alabama. I had chosen this campground since our friends from RV-Dreams had recently rated it as their number one campground in their 4+ years of fulltime camping. I can say without a doubt that we agree with their rating. Typical tent site at Corinth-Awesome!! The words that come to mind for this park are pristine and precise. 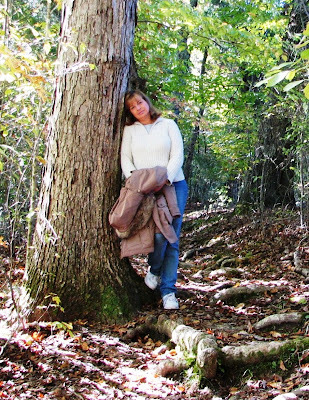 It is overseen by a special organization called the Cradle of Forestry. 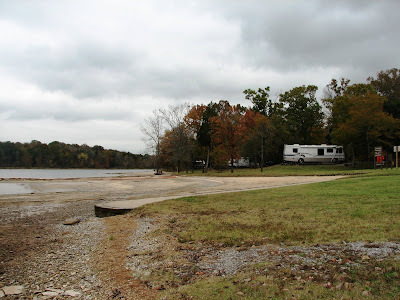 Ken and I could have easily stayed here a week as it fits exactly our idea of the perfect locations and set up for truly enjoying the RV lifestyle. Once again, as we explored the area we came across interesting plant life that we couldn’t identify until we got on the internet. 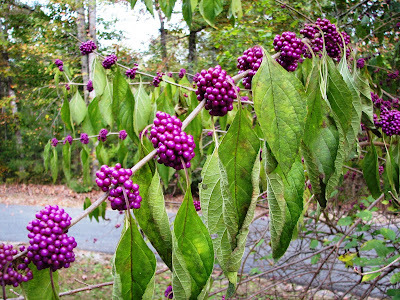 Don't eat these beautyberries as they apparently contain a mild hallucinogen! We were sorry we didn’t have time to take the Sea Eagle out for some fishing on the lake. It was so calm and peaceful there. 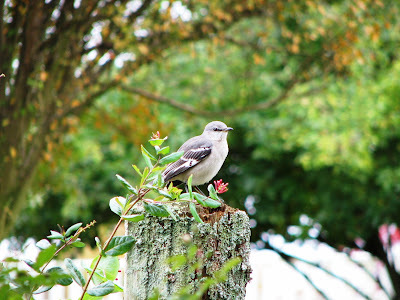 The second reason we chose this campground is that it was not too far from Red Bay, Alabama. 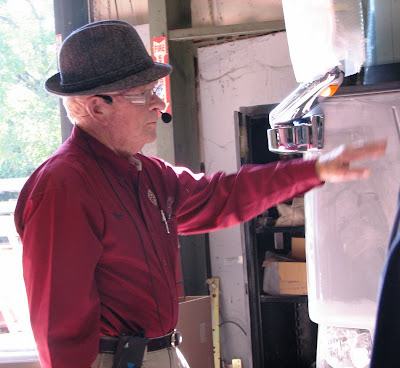 Ken and I had been interested in the Tiffin Motorhomes for some time now and were told that we’d have an even greater appreciation of this product if we toured the plant. On Wednesday morning we drove the jeep over to Red Bay and easily followed the signs to the Tiffin plant. They have a short movie presentation at the visitors center and then you’re off to the plant. They are extremely open here. You can talk to the factory workers and they are very happy to talk to you about what they are doing. There’s no problem taking pictures anywhere. In fact, Bob Tiffin is well-known for his open door policy. If anyone has a specific problem or concern about his product that they want to cover with him he welcomes them to come to his office and he’ll be happy to meet with them one-on-one. Almost everyone except us on our tour already owned a Tiffin product, most staying in the Allegro Campground nearby. Without exception, all went on and on about how much they loved their units, the quality and service they received from Tiffin. The tour guide uses a wireless microphone, with each of us having individual wireless headphones so we could hear him even while we ventured about the plant on our own. My years ‘lean’ materials and shop floor planning added to my positive impression of this make-to-order environment where there was a lot of specific fixturing , and just-in-time staging of materials in sequence with the build schedule. 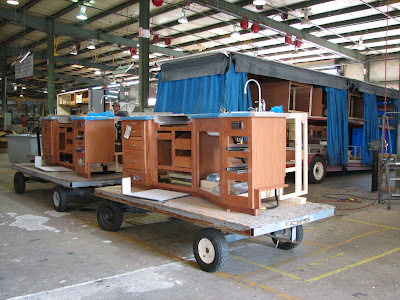 Phaetons, Allegro Buses, Allegro Reds and gas Allegros all down same assembly line. Great example of mixed model assembly-- 30 days end-to-end leadtime on a rig with current production schedule at 7 units out the door per day. Never build to stock. All units are sold to dealer before started. At high point they have done 16 units. In January they were at the lowest in a decade of 3 units per day. We were lucky enough to talk to the workers about a brand new model of Red (front-engine diesel) going down the line. Obviously, a new design is a challenge the first time through but the positive attitude of these employees toward their product was really impressive. 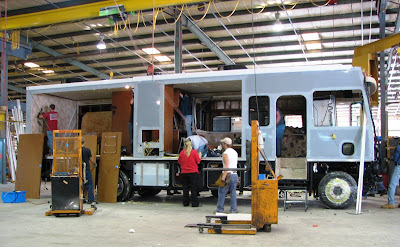 We also heard that they will soon be putting a brand new 30 foot model down the assembly line. I think the idea of staying 30 foot and under for some of the older parks makes a lot of sense although I don’t think Ken would be willing to give up his diesel anytime soon. The other really impressive part of the Tiffin campus is the Service facility where there are 50 bays devoted specifically to servicing sold product. 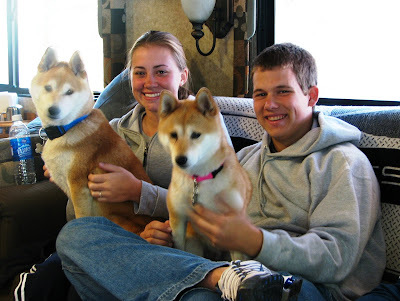 Tiffin is well known for their interest in providing exceptional service to their owners and our fellow tour participants all confirmed that. While you can get your Tiffin serviced at the dealer, many owners love to bring their units back to Red Bay because of the top-notch attention they receive. We’ve heard some really impressive stories about the service crews adding ‘options’ for folks at little-to-no added cost to let the owner have his rig ‘his way’. 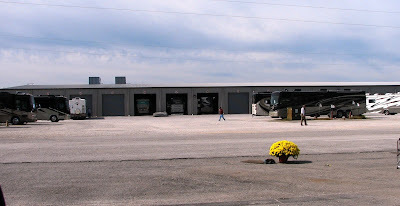 Beside the service facility is the company-owned Allegro Campground with over full hookup 100 sites. These are free to owners during their warranty period and then $10 per night after. They were in to overflow parking when we were there, likely because of number of ‘snowbirds’ in flight and getting maintenance work done on way to their winter roosting location. Tiffin owners we met there explained that they made reservations for service work, came to the campground ahead of time and then drove to their assigned bay when called. They reviewed with 3 techs all their concerns/wishes, and normally within that same day, their fixes/updates would be completed and ready for their inspection. Ken and I both came away truly impressed with this company. After spending decades in manufacturing management, I felt a special appreciation for their transparency, efficiency, attention to quality service and perhaps most important they way the assembly floor employees seemed truly proud of their product and their company. 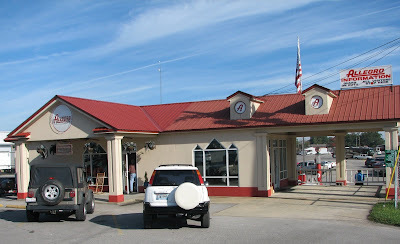 After the tour, Ken and I stopped at a small restaurant in Red Bay for a late lunch and then headed back to Corinth. On the way we were stopped at the library in Double Springs to check our email. 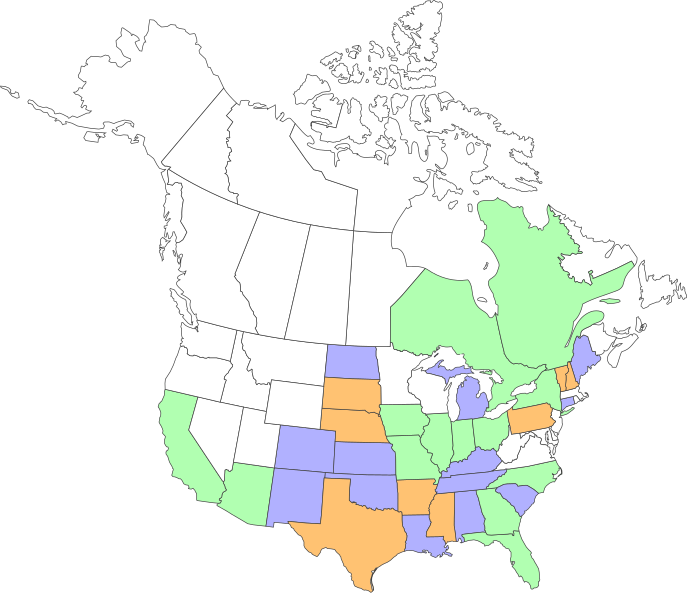 I wish now we would have taken the time then to get our blog posts up-to-date since as it turns out it was many more days before we got a good connection again. 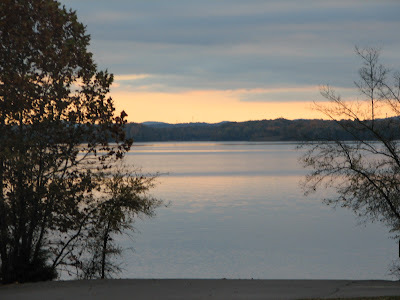 The managers at Corinth Recreation Area were very friendly and had invited us to join them and some of the campground host couples to enjoy a catfish buffet at a nearbly restaurant Thursday evening. Meantime, however, we were finding some problems with the various parks we had as on next stop options for the weekend game. 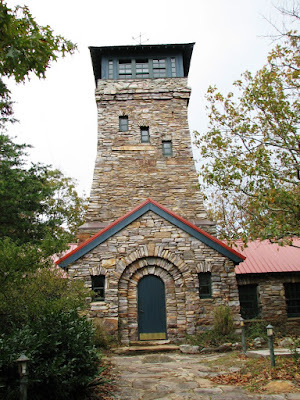 After getting some recommendations from the folks at Corinth and making some calls it appears our best bet is Cheaha Mountain. Problem is that when Ken called them he was told we probably needed to get there Thursday if we wanted to be sure we got a spot. Too bad. We really wanted to stay at Corinth longer. Stay tuned. Next post should cover the big game against top ranked Jacksonville State and our visit with our good friends from Atlanta, the Ellsworths. Sunday, Oct. 18th, the day after the funeral, we packed up and were on the road about lunchtime. 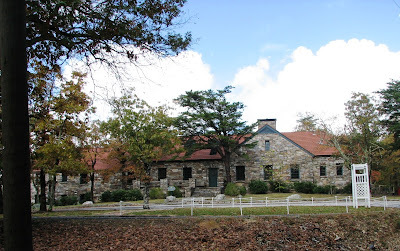 We stopped for the night at Fort Massac State Park, at the southern tip of Illinois. We arrived at the same time they were ending their annual autumn Civil War re-enactment,. This event apparently draws up to 80,000 people and there was still a huge encampment set up. Unfortunately, in trying to find our way in to the campground, there were temporary roadblocks at the campground and we ended up in the middle of this event on a small one lane road. This is only the second time in all our travels that we had to unhook the toad to get turned around when we got off track. Luckily, a conservation officer nearby checked via radio to be sure we could find space in the campground and then assisted in traffic control so that Ken could negotiate turning around in a very tight space. 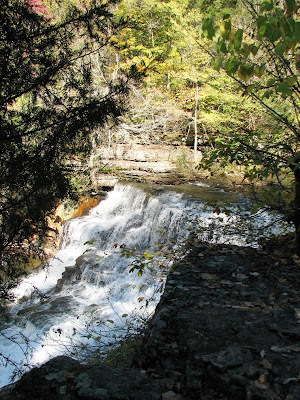 On Monday morning, we headed out around 8:30 am., arriving at our planned destination, Old Stone State Park,Tennessee by late afternoon. I had chosen this stop because of the archeological significance. It’s thought that the area was built as a sacred site of the ancient Woodland Indians in the area, back around 500BC. 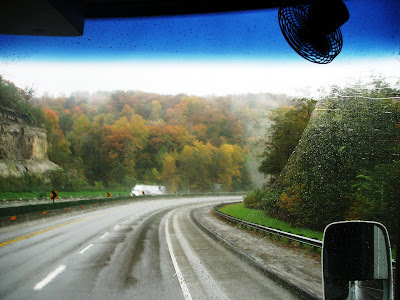 This campground also gave us a comfortable drive to and from Jack Daniel’s Distillery in Lynchburg, TN. 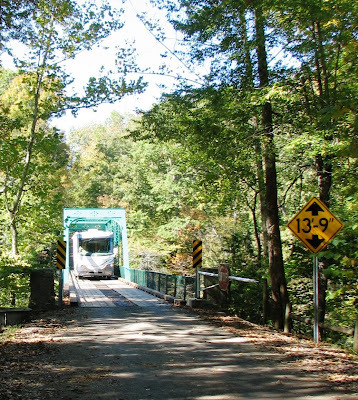 While only a few miles from the interstate, we now know that the bridge access to the campground is probably not something that should be attempted in a diesel motorhome. Crossing the bridge to the campsite...tight squeeze!! Note the 10T weight limit for 2 axles....hmmm....our bad!!! 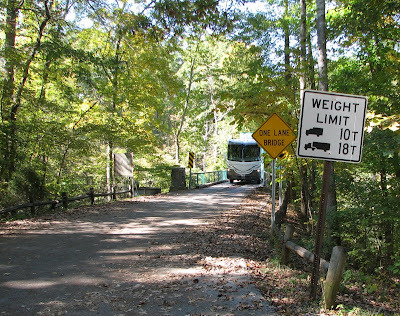 On the way in we misread the sign as ok for us, 18 tons and we are about 14 tons. Paying closer attention once we were across we realized that for a dual axle vehicle like ours the limit was 10 tons. There was no other way in or out of the campground though so at that point we had to come back across. 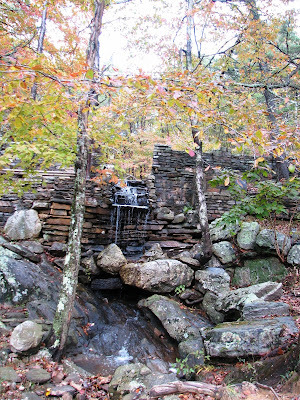 The Old Stone Fort is located between two forks of the Duck River. Since we were only staying for one night, we were not too picky on the site we chose. You’ll notice the firepit and table were behind the rig which we would not have liked except we didn’t plan to use them so not a problem. I took the dogs for a quick walk. 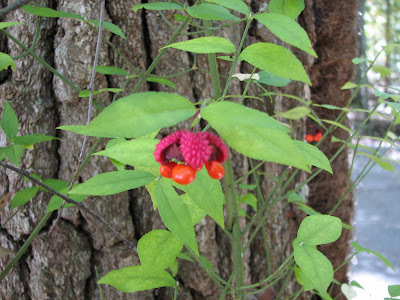 There did not seem to be a campground host onsite but I did come across this plant which Ken and I couldn’t identify. We definitely need a more comprehensive wildflower and plant guide since this doesn’t appear in our wildflower or Audubon tree guide. Any reference guide recommendations would be much appreciated. 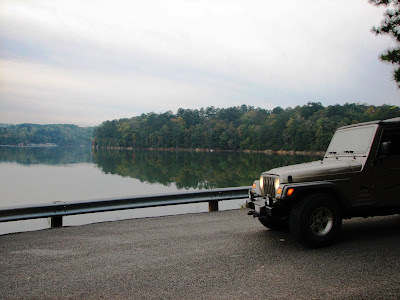 We quickly got back on the road, this time in the jeep, to make our way to Lynchburg. We met the forest ranger on the way out and paid our $20 fee. She said that with budgets as they are, Tennessee no longer honors the Golden Access Pass. I drove to Lynchburg to give Ken a break from behind the wheel. Also gave him a chance to study the maps. 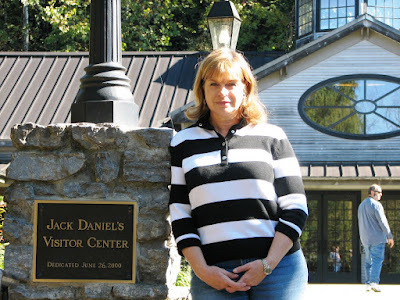 Jack Daniel’s Distillery is easy to find, with the Visitor’s Center on the highway going in to town. We enjoyed the various exhibits in the visitor’s center while waiting for the next tour to leave. 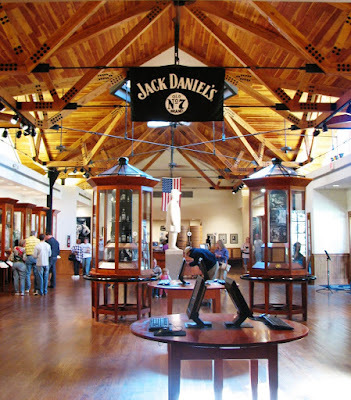 There is a lot of ‘legend’ around Jack Daniel. For example, he was known to be quite a lady’s man, which is thought to be how the name came about ‘Gentleman Jack’. Also, the ‘No. 7’ label has no clear origin but again local lore ties it back to his romantic relationships. 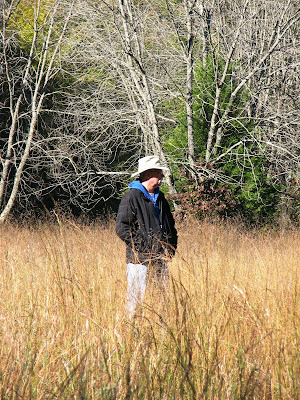 The tour was especially enjoyable because of the tour guide who was a really great storyteller in his native Alabaman drawl. 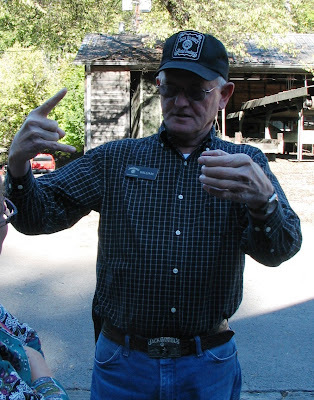 Our guide demonstrating how to pour ‘2 fingers’ of Jack Daniel’s! Apparently Jack Daniel’s kicked it in frustration, broke his toe, got infection and died from the infection. 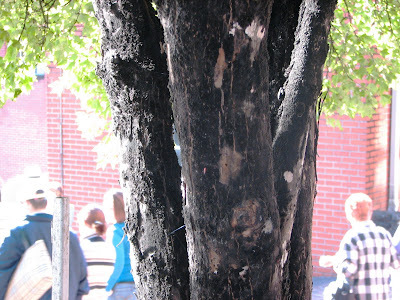 Notice the black fungus growing on the trees. Supposedly you’ll see this anywhere there is a still in operation. Unfortunately there are no ‘free samples’ at the distillery since it is actually in a dry county!! 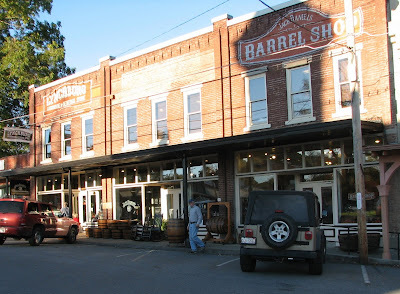 After the tour we drove in to Lynchberg and had a late lunch/early dinner on the square. Had we more time we would have planned to do lunch as Miss Bobo’s Boarding House and perhaps will do that on another Tennessee visit when we are not under a strict schedule. We really enjoyed the 2-3 hours we spent exploring this area. The setting is so naturally beautiful, its easy to understand why the ancient tribes considered this sacred space. 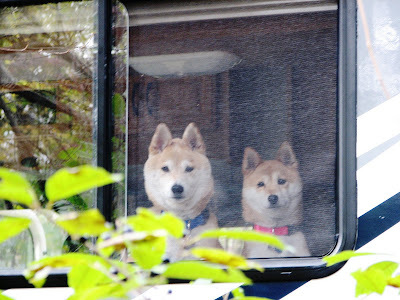 We came back to the RV then and loaded up so that by 1pm, Tuesday we were on our way in to Alabama.